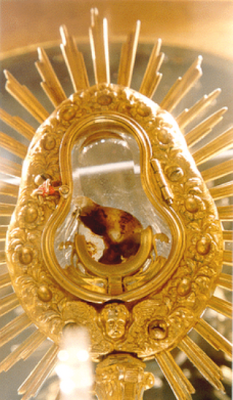 The Eucharistic Miracles of Lanciano (top) and Santarem. I have been blessed to see two Eucharistic miracles in my life. I saw the first one eleven years ago in the Church of St. Stephen, in Santarem, Portugal. So the woman pretended to be ill and went to see the local priest at St. Stephen’s, asking him for prayers and for Holy Communion. The priest innocently gave her the Eucharist, which the woman took out of her mouth (obviously when the priest wasn’t looking) and put into the veil she was wearing on her head. But she never made it to the witch’s house. As the woman left the church, the host began to bleed! She panicked (which is quite understandable! ), ran home with the bleeding host, and put it into the cedar trunk where she kept her clean linens. During the night, however, the woman and her husband were awakened by bright rays of light coming from the trunk. At that point, she confessed to her husband what she had done. Not surprisingly, both were converted on the spot! The two spent the entire night in adoration of the Blessed Sacrament. Some neighbors also saw the light that evening, and they began coming to the house the next day. Finally the parish priest was told. He took the Eucharistic miracle back to the Church of St. Stephen, where it’s been ever since—and where I saw it in 2003. 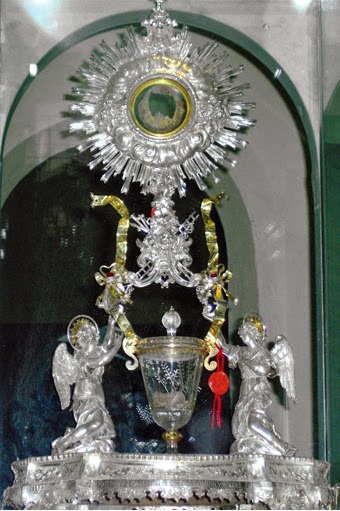 The other miracle, which I have preached about on several occasions in the past—and which is one of the most extraordinary Eucharistic miracles of all—I finally got to see in person on our recent pilgrimage to Italy. The blood of the Eucharistic Miracle is real blood and the flesh is real flesh. Both belong to the human species. The flesh consists of the muscular tissue of the heart. The flesh and blood have the same blood type (AB positive). The proteins in the blood are in the same proportions as those found in normal, fresh human blood. There is no trace whatsoever of any materials or agents having been used to preserve the elements. This is probably the most famous of all the miracles that have occurred since Jesus instituted the sacrament of the Eucharist at the Last Supper. 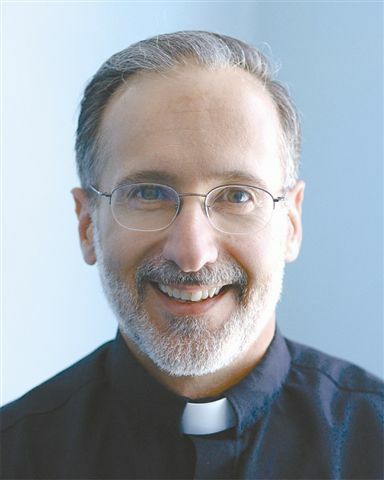 Now you may be surprised to learn that one of the lesser known Eucharistic miracles took place just a couple of decades ago—in the 1990s—and it involved our present Holy Father, Pope Francis, when he was a bishop in Buenos Aires. I read about this one just the other day. Oh yes, one more interesting fact about the flesh in Buenos Aires: DNA tests revealed an exact match with the flesh at Lanciano, along with the same blood type (AB positive)—which indicates that the two pieces of flesh came from the very same person, even though the miracles that produced them were separated by more than a thousand years! And yet, as we all know, 99.99999% of the time the accidents (i.e., the physical properties) of the bread and wine don’t change along with the substance. Even after the consecration, the host still looks like bread and feels like bread and tastes like bread; and the consecrated wine still has the physical properties it had before the Eucharistic prayer was said over it. Lord Jesus, today we thank you for loving us by giving your life for us on the cross—and by humbling yourself in this way and becoming our spiritual food. Help us to be more aware of your presence in the Holy Eucharist in the future—so that we will always be concerned to be reverent and properly disposed when we receive, and so that we will be open to all the graces you want to give us in and through your holy Body and Blood. Amen.